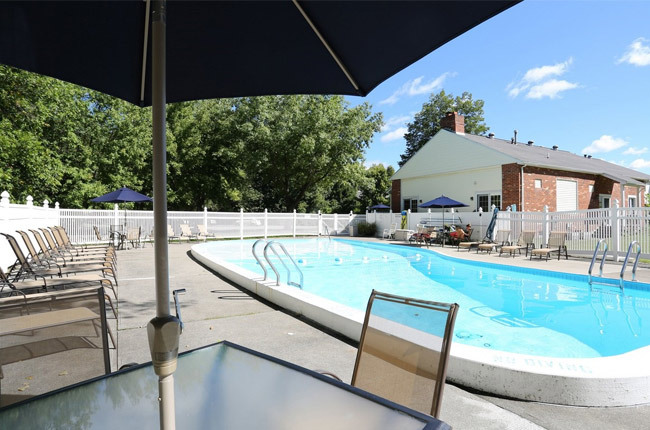 Located in the Gates-Chili School District, Little Creek Garden Apartments in Rochester, New York is an apartment community that provides the perfect setting for the suburban lifestyle you have always desired. Perfectly positioned among lush, manicured landscaping, our sturdy brick and vinyl exteriors boast very modern and convenient interiors. Our amenities were implemented to please even the most discerning resident. Once you are ready to leave all of the comforts of your apartment home, indulge in our sparkling swimming pool as well as fifteen-acres of natural woodlands, an effervescent brook, and a three-acre pond. At Little Creek Garden Apartments, it has never been easier to connect with the elements of nature. With incomparable style, a beautiful natural setting, and first-class customer service, Little Creek Garden Apartments aims to please your every whim. Little Creek Garden Apartments boasts a central location in the heart of Rochester, New York. Our convenient location is located among the best shopping, dining, and entertainment opportunities in the city. You will find a plethora of restaurants to the north of our community, offering every type of cuisine from authentic Italian to mouthwatering Southern-style barbecue. If dining out does not suit your interests, you will soon discover that shopping has never been easier with nearby Marketplace Mall, which houses retailers such as JCPenney, Bath & Body Works, and Aéropostale. When our outdoor swimming pool isn’t enough to satisfy your cravings for sunshine, Westgate Park and Davis Park are located in the immediate area. With all of the activities in the surrounding area, Little Creek Garden Apartments encourages residents to indulge in the active, vibrant lifestyle they have always desired.